OHEKA CASTLE has enjoyed a storied and celebrated past. Built in 1919, this magnificent New York estate served as a summer home for financier and philanthropist Otto Hermann Kahn. Kahn took the name for his estate using an acronym from his own name: Otto HErmann KAhn. At 109,000 square feet and 127 guestrooms, the castle remains the second largest private residence ever built in America. Throughout the Gilded Age of the 1920’s, this peerless estate was the site of many parties and celebrations, and Kahn entertained everyone from Hollywood legends to distinguished royalty. Kahn passed away in 1934, and the renowned property changed ownership and purpose several times, serving as both a retreat for New York sanitation workers and a government training school for Merchant Marine radio operators. In 1948, the Eastern Military Academy bought OHEKA, however the school went bankrupt 30 years later. OHEKA then stood abandoned and essentially fell into ruin. Yet, current owner Gary Melius saw the intricate beauty of OHEKA CASTLE and purchased the property in 1984, despite the fact that at that time it was lacking electricity, plumbing, windows, and doors. The Castle, still owned by the Melius family, underwent an extensive renovation, carefully maintaining the rich history of the majestic hotel. The grandeur of the 1920’s still remains at OHEKA CASTLE, offering an unrivaled getaway for all guests. • Otto Hermann Kahn purchased 443 acres of land in Cold Spring Harbor, where OHEKA was to be built, for 1 million dollars. • Two (2) years were spent building the hill on which the estate was to be built, making it the highest point on Long Island. • Architects: Delano & Aldrich (one of the Gold Coast’s premier mansion builders). • Landscape Architects: Olmsted Brothers (firm established by Frederick Law Olmsted, architect of New York City’s Central Park). Landscape Architect and Gardener Beatrix Farrand was commissioned by the Olmsted Brothers to design aspects of the Formal Gardens. • The building of OHEKA was complete. • The original cost to build OHEKA was $11 million ($158 million in today’s currency). • Otto Hermann Kahn, his wife Addie, and his 4 children used OHEKA as their summer home and weekend retreat. • The name “OHEKA” is an acronym for Otto HErmann KAhn. • The Kahn Family Motto was "Ever Restlessly Forward." • The Cold Spring Country Club was once the original horse stable, and the golf course was once part of the original 443 acre Estate. • At 109,000 square feet, OHEKA was and remains the second largest private home in America (only The Biltmore in North Carolina can boast grander dimensions). • Construction: Reinforced steel & concrete with some walls 2’6” thick. 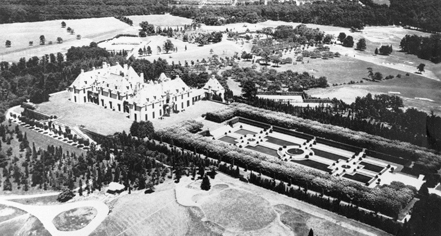 • OHEKA originally consisted of 127 rooms. • 126 full-time servants were originally employed by Otto Kahn. • A total of 39 working fireplaces existed throughout the estate. • The Grand Staircase in the Entry Foyer was inspired by the famous exterior staircase from the Chateau Fountainbleu in France. • The Ballroom is 72’6” x 32’5” with a 24’ ceiling height. • The Formal Dining Room is 51’6” x 30’2” with an 18’ ceiling height. • Otto Kahn’s fear of fire prompted him to use fireproof materials in OHEKA and to paint the plaster walls in the Grand Library using a technique developed in the middle-ages, called "faux bois" which gives the plaster walls the warmth and grain of fine wood paneling. • The Library once had a secret passageway hidden in one of the bookcases which led into a small chamber referred to as his secretary’s office. • The emblem of “The Linden Tree” seen throughout the estate was the symbol of Kahn’s hometown in Germany. • Otto Kahn's daughter, Maud, marries on June 15, 1920, and becomes OHEKA's first bride. • The NY Times declares OHEKA, "The finest country house in America." • Otto Kahn died of a heart attack. • The image of Otto Kahn is used as the inspiration for the character "Mr. Monopoly." • The family sold OHEKA to the Welfare Fund of the Sanitation Workers and it became a retirement home for the sanitation workers of New York City. They re-named OHEKA “Sanita." • OHEKA became a radio operator's school for the Merchant Marines. • The greenhouses were sold to the Otto Keil family and are now known as The Otto Keil Florists. • OHEKA was owned and occupied by the Eastern Military Academy. • OHEKA was abandoned and fell into almost total disrepair. • The Cold Spring Hills Civic Association consisting of residents of Cold Spring Hills sought to preserve OHEKA. • Gary Melius, a Long Island developer, purchased the devastated estate of OHEKA which had no electric, plumbing, windows, or doors, and its 23 remaining acres, for 1.5 million dollars. • A total of 300 - 30 yard containers (9,000 yards) were used to discard all the debris. • Restoration began to restore the estate to its original grandeur. • A total of 222 windows and doors were installed to seal and protect the estate. • 4,000 roof slates were purchased from Rising & Nelson Slate Co., the same Vermont Quarry used by the Kahn family, to restore the damaged roof. • OHEKA CASTLE becomes a Wedding Venue and hosts its first wedding on May 7, 1987. • The Friends of OHEKA, a not-for-profit corporation, was formed by community members of Cold Spring Hills and Huntington to protect, preserve, and raise public awareness of OHEKA. • The Terrace Room was added to the Estate to accommodate larger events. With the addition of the Terrace Room, OHEKA is currently 115,000 square feet, comprises 117 rooms, and 50 baths. • 500 Red Cedars were planted and now line West Drive, leading to the courtyard, to further restore the estate to its original design. • 44 London Plane trees were planted in the Formal Gardens to replace the missing trees that existed in the original design. 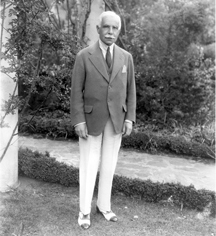 • 2,505 Boxwoods were planted around the reflecting pools to further restore the Formal Gardens to its original design. • 259 new windows and doors from Italy began being installed throughout the estate. • OHEKA’s Bar & Restaurant opened to the public. • The Bar & Restaurant is officially re-named OHK Bar & Restaurant. The logo is inspired by an original logo created by Otto H. Kahn in the 1920s. • 85% of the Estate and Gardens are currently restored with future plans to restore the remaining 15% of the estate into a luxury spa. OHEKA CASTLE, a member of Historic Hotels of America since 2004, dates back to 1919.